This is a mint, unused set of two clear 16 ounce pint glasses featuring the art images of George and his dog Astro from the popular Hanna Barbera cartoon TV show The Jetsons. On the back is the series name logo. They come in an illustrated box. 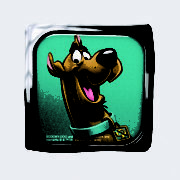 Produced by Spoontiques, this is a decorative visor clip featuring the image of Scooby-Doo from the popular Hanna-Barbera TV show. This is a new and unused light grey and clear, twist open, 24 ounce acrylic water bottle featuring Scooby and the gang in the Mystery Machine as seen in the Scooby-Doo cartoons. Zoinks! Hop aboard the Mystery Machine and help the gang foil bad guys with this officially licensed deck of Scooby-Doo playing cards with a different picture on each card. This mint, embroidered patch measures 3.35″ wide and features the image of the Mystery Machine van from the popular cult favorite animation TV show Scooby-Doo. 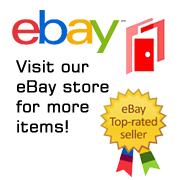 It has been stored in a smoke and pet free environment and has a glue backing for easy application to a cloth surface. 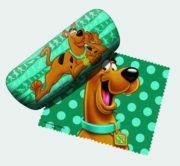 This is an eyeglass case with a cleaning cloth that measures approximately 6″ featuring the comic art image of the popular animated character Scooby-Doo on the case and the cleaning cloth features and additional animated image. 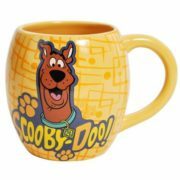 This mint, unused stoneware rounded oval ceramic coffee mug features the image of Scooby-Doo above his name. Produced in 2012, this is a 2 1/4″ high figure of Scooby-Doo. Put it in a container and fill with water and it will grow slowly over the next 12-24 hours up to 6 times its original size. This is a 24 ounce red party cup that features the animated art of Scooby-Doo relaxing. free. Hand wash recommended.. Produced in 2015 this is a new unused 14 ounce ceramic travel mug that features the image of Scooby-Doo laughing, from the Scooby-Doo cartoons. This is an acrylic travel cup with a straw that features the animated art of a laughing Scooby from the Scooby-Doo cartoons. This is new and unused and stored in a smoke and pet free environment. This is a new and unused light grey and clear, twist open, 24 oz. acrylic water bottle featuring the animated art figure of Scooby running from the Scooby-Doo cartoons. 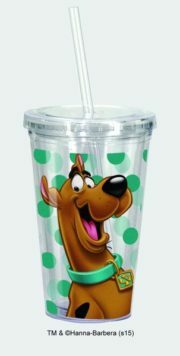 This is an 18 ounce clear plastic water bottle featuring the smiling image of Scooby from the popular animated cartoons. Standing 11″ tall, it has a spill proof sport lid with a sippy straw and a new flip-top design. Water bottles are eco-friendly, non-toxic, reusable and recyclable. It also has a hook at the top for attaching to back packs or belts. 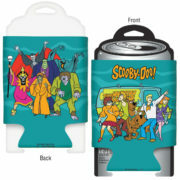 This is an illustrated blue insulated neoprene drink can cooler featuring the cast and monsters from the hit animated TV series Scooby-Doo! in a wraparound design. 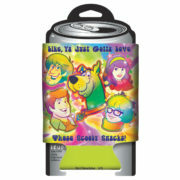 This is an illustrated psychedelic insulated neoprene drink can cooler featuring the Scooby gang from the hit animated TV series Scooby-Doo! in a wraparound design. They are surrounded by the words “Like, Ya Just Gotta Love Those Scooby Snacks!”. This amazingly detailed model starts as two steel sheets and finishes as a 3-D Caricature model. 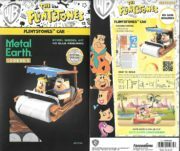 It is approximately 3″ tall when assembled and this one features Fred and Barney in Fred’s car from the classic Hanna-Barbera animated TV series The Flintstones. The sheets contain detailed laser etching for easy removal. Complete instructions are included to show you how to pop out the pieces, bend the tabs, and connect them at the attachment points with an average assembly time of 30-45 minutes. This one is of moderate difficulty and is stored in a smoke and pet free environment. We also offer an optional LED base or a Solar Spinner for better display of your model. 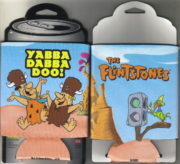 This is an illustrated insulated neoprene drink can cooler huggie featuring the Flintstones Fred and Barney in their lodge hats on the front and the name logo on the back from the hit Hanna-Barbara animated comedy TV series The Flintstones. It is a new and unused licensed can cooler. 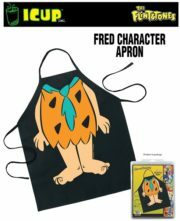 This is a black polyester adult apron featuring the image of Fred from the animated TV Series The Flintstones. This is a new, unworn apron still in its original packaging. It’s stored in a smoke and pet free environment. This is a ceramic coffee mug in the image of cast of Fred Flintstones from the cult Hanna Barberra TV series The Flintstones with the phrase “I don’t Yabba dabba doo mornings” on one side and Fred Flintstone on the other. 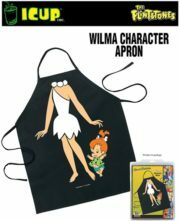 This is a black polyester adult apron featuring the image of Wilma from the animated TV Series The Flintstones. This is a new, unworn apron still in its original packaging. It’s stored in a smoke and pet free environment. This is an illustrated insulated neoprene drink can cooler featuring the animated art of the cast from the classic Hanna Barbara animated TV series The Jetsons on one side and the image of Rosie the robot on the other. 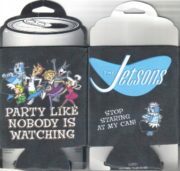 Under the image are the words Party Like Nobody Is Watching and the Jetsons name logo and the words Stop Staring At My Can are on the reverse.